It is both his cover and euphemism for what he does. Ostensibly, he works for a neighborhood laundry service, but he specializes in removing “stains” from clients’ lives. He is a coolly dispassionate hitman, with support staff to help with the cleaning. 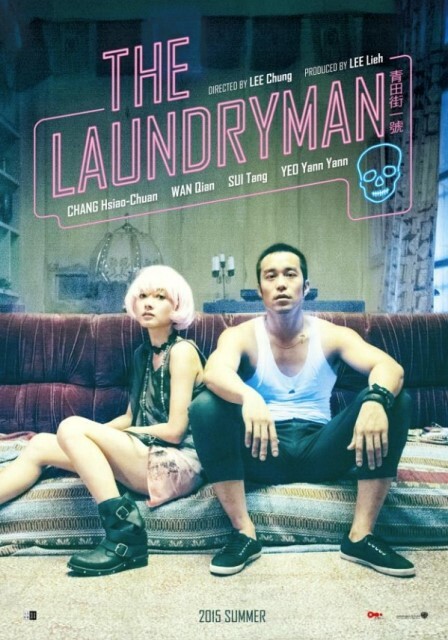 However, he will have to seek professional help of a different sort when his recent victims start haunting him in Lee Chung’s The Laundryman (trailer here), which screens during the 2015 Chicago International Film Festival. His boss A-gu is the rainmaker and he does the dirty work. For years, this arrangement has worked for “No. 1, Chingtian Street.” Yes, that is what he is known as, to the few who know the contract killer (it is a long story that will be revealed in due time). He leads a rather solitary life, but that makes it easy for the stunningly beautiful A-gu to manipulate him. They go way back, in an ambiguous way. When he finds himself genuinely haunted, she refers him to nightclub psychic Lin Hsiang. Despite her hipster style, she is legitimate enough to see the abusive self-styled ladies’ man he just offed and the old couple he whacked before him. However, he has no idea who the silent young woman ghost is or was. With Lin’s help, he will track down the customers who paid for their hits, in order to satisfy their curiosity and hopefully move them along into the spirit realm. Complicating matters, a sinister party seems to be trying to thwart them. The resulting chaos also attracts the attention of a soon to retire police inspector. It gets to the point where a hitman doesn’t know who to trust. Although Laundryman starts out as a comedy, it gets real serious, real fast. Lee and Chen Yu-hsun have written a surprisingly complex tale of betrayal and dark secrets from the past, freely incorporating all kinds of genre elements cafeteria-style. It is a wild ride, but they keep us safely buckled into the roller coaster. Rising star Joseph Chang Hsiao-chuan has the perfect brooding physicality for No. 1, Chingtian Street, not unlike his quietly ominous work in Soul. He also develops some radically different but equally credible chemistry with Sonia Sui Tang as the particularly fatal femme fatale A-gu and Wan Qian’s Lin, the increasingly sober and freaked out party girl psychic. These are not your standard genre film types, even before Lee thoroughly disrupts their worlds. Lee fully capitalizes on the cinematic creepiness of A-gu’s laundry facility, settling into a zone best described as supernatural noir. Yet, despite the general moodiness (heightened by Yao Hung-i’s eerie cinematography), he maintains a vigorous pace. Frankly, The Laundryman is exactly the sort of foreign film that feels ripe for a wildly inferior Hollywood remake, but it would be especially daunting to follow in Sui’s compulsively scene-stealing footprints. Highly recommended as a first class supernatural mystery, The Laundryman screens Friday (10/16) and Tuesday (10/20), as part of this year’s Chicago International Film Festival.